Years ago, when it came to shopping for a facial moisturizer, I always sought out a fancy bottle sitting at the speciality counters in department stores. You know, the kind of bottle with an ingredient list so long and impressive that you’re immediately sold on the idea that something extra special sits inside. And since the ingredient list was so special and the bottle was always so pretty, I felt guilted into buying the product, This must be what my skin is missing! What will happen if I don’t use this product? Now, I call this whole thought process FOMO, the Fear Of Missing Out. Since I certainly didn’t want to miss out on anything, I spent way too much money on fancy moisturizers for many, many years. I was a marketer’s ideal (naive) client. Please tell me that I’m not the only one who instantly jumped at marketing claims, pretty bottles, and long ingredient lists with “special” chemicals. 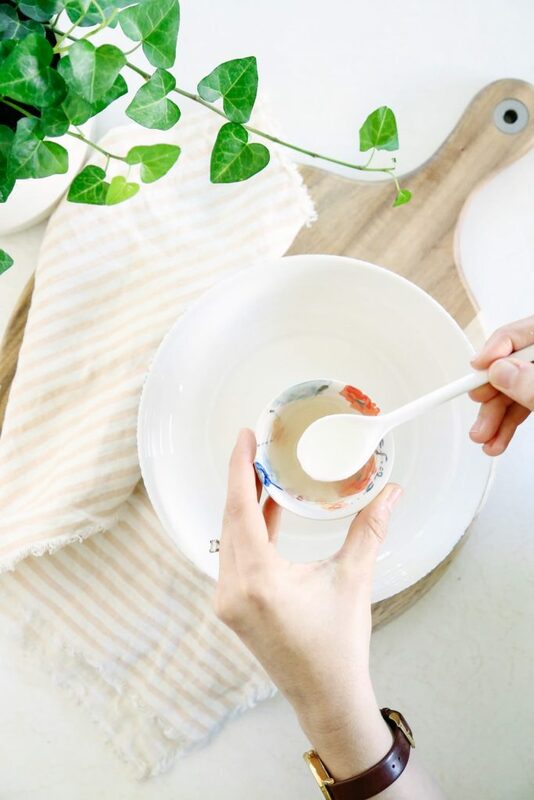 Here I am, years later, sharing a simple two ingredient moisturizer, and it isn’t the first simple homemade moisturizer that I’ve shared on the blog. When I first started my quest to seek out “cleaner” skincare products, I learned about coconut oil and its 1001 uses. One of its many uses includes moisturizing the skin, so I started using coconut oil as a face and body moisturizer. I loved that moisturizer, but I found that after some time, my face needed a break from coconut oil. While the rest of my body did well with the coconut oil moisturizer, my face needed something different. Over the past few years, I’ve experimented with many different options when it comes to moisturizing my face, some have been absolute failures and others have been great successes (the successes have made their way to the blog). When it comes to skincare, I’ve learned that it’s important to get to know my skin, pay attention to what works for me, and keep things simple. In fact, the simplest of formulas have proved to be the best for my skincare routine, both in the way my skin looks and feels, and the long-term maintenance of making and using the product. My favorite way to moisturize my face currently is with a simple oil moisturizer. 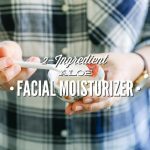 I shared about this moisturizer in my fall and winter skincare routine, and later shared my recipe and tips for creating an oil moisturizer. The oil moisturizer is amazing, but as the hot, humid months approach, I’ve been wanting something a bit lighter for my face. The solution? Aloe and oil. Pretty much my two favorite skincare ingredients, along with honey. Combining aloe and oil is much like combining water and oil, so it’s not a natural combination that easily blends together. Despite their differences, I’ve found the aloe is the perfect “lightening” agent for the oil. To get around the oil and water issue, I simply shake my moisturizer bottle before I use it. With a good, vigorous shake, the aloe vera gel and oil come together to create a light moisturizer that sinks into my skin. I’m looking forward to using my aloe moisturizer throughout the spring and summer, and then transitioning back to my oil moisturizer in the fall and winter. Aloe and oil. Pretty much my two favorite skincare ingredients, along with honey. jojoba oil or other nourishing oil: grapeseed, sweet almond, apricot kernel, argan, or tamanu. In a small bottle (I use a 4oz. bottle), combine the aloe vera and nourishing oil in equal amounts. Feel free to play around with the ratio that works best for your skin. Shake the bottle to combine the ingredients. If you'd like to add additional ingredients, I suggest adding a small amount of vitamin E oil or a few drops of your favorite skin-friendly essential oil (I love lavender, tea tree, or carrot seed). To Use: Before use, I vigorously shake the bottle for a few seconds to combine the ingredients. Then, I place a small amount of moisturizer on my (clean) fingertips and massage the moisturizer on my face. I use this moisturizer on my face, and prefer a thicker lotion or body butter on my body. Aloe vera is a common ingredient used to treat sunburns due to its soothing and antioxidant properties. If you’re interested in some of the benefits of aloe vera, this article from Mind Body Green is very insightful. It’s important to purchase a quality aloe vera gel that doesn’t contain a bunch of yucky ingredients. My favorite brand is Real Aloe (sold in health food stores and online). I haven’t tried using fresh aloe vera. If you use fresh aloe, you’ll need to refrigerate the moisturizer and use it within a few days. Choose an oil that’s best for your skin. For me, it’s taken a lot of playing around to discover oils that work best for my skin. 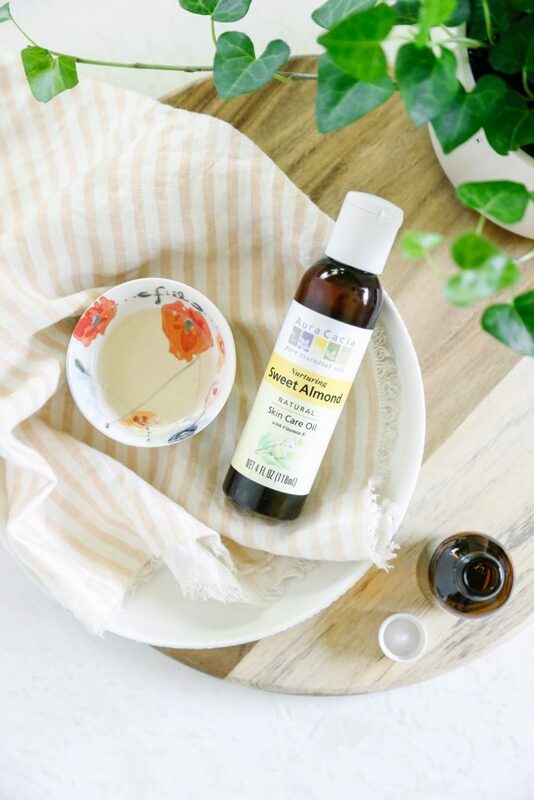 Grapeseed or sweet almond oil are known for being very light and gentle oils, so they may be a great choice for many folks. I’m currently using sweet almond oil for the spring and summer months. 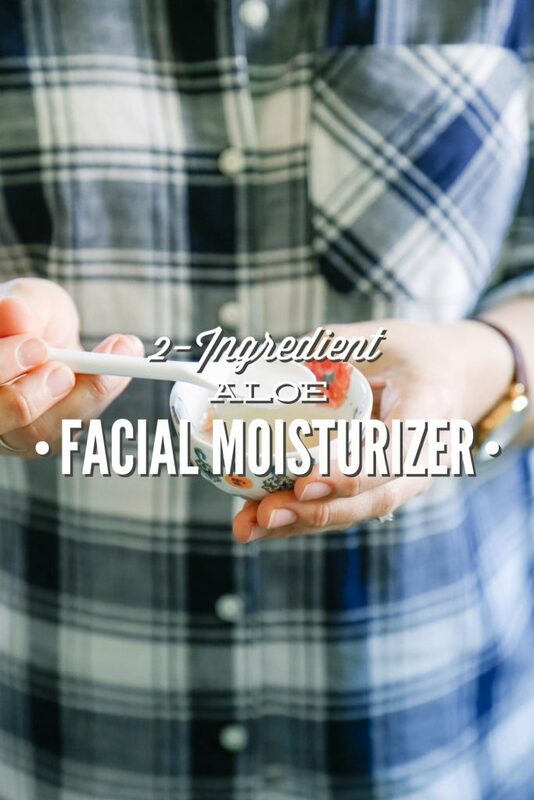 You can even use coconut oil to create a facial moisturizer (find my recipe here, which I use after shaving), if your face does well with coconut oil. Hello! I have your Rosehip and argan oil moisturizer recipe and I was wondering if I could add aloe Vera gel to it and use that as a moisturizer? Love your blog! Hey Yaritza, Definitely. Make sure the aloe has a preservative versus fresh aloe. This is fantastic! I tried coconut oil but found my skin would breakout occasionally. I imagine the aloe will feel cool and refreshing during the summer months too. Hey Brie, I’ve talked to so many folks with the same coconut issue. I hope this moisturizer helps :). Hi! what kind of bottle does this need to go in? Glass, plastic? I was hoping to put it some kind of bottle that could easily squirt into my hand. I’m brand new to this all natural skin care stuff, so I have no clue about the rules for storing these concoctions, but I see that most of the EO and some of the facial oils are sold in the amber colored glass bottles, so I didn’t know if this should go in that type of bottle. I am planning to add some EOs to mine, if that makes a difference. Thanks!! Hey Stephanie, For this, you could definitely use a plastic squirt bottle, similar to the travel bottles sold at Target. Just make sure to make a small batch so the moisturizer is only stored in the bottle for a few weeks. The main concern with plastic is that it can leach, especially when using an essential oil. I just happen to have a lot of amber bottles around so that’s what I’m using. 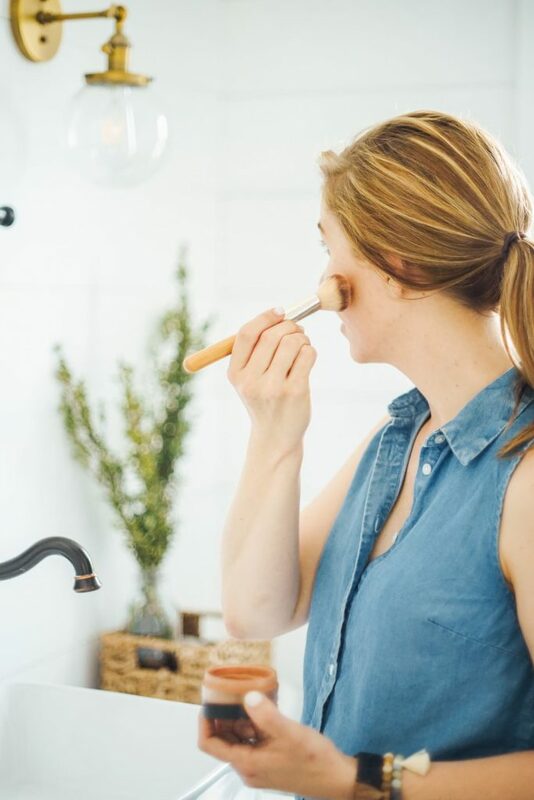 After experimenting for several years with DIY cosmetics, lotions and cleaning products I can tell you there have been WAY more failures than successes, which is why I always come back to your site. I know you have tested and “tweaked” the recipes and they work. This is a perfect example. I mixed my aloe vera gel with jojoba oil, and added some lavender EO for scent and some red raspberry seed oil for sun protection. The stuff goes on smooth, it absorbs quickly and feels oh so soothing! This will be my new “go-to” summer facial moisturizer. Thank you!!!! Hey Betsy, Thank you so much, that’s such a sweet compliment. I work very hard to make sure everything that’s posted on the blog is very well tested, and then something I’ve been making/using for a certain amount of time (versus just making something yesterday ;)). I’m so glad you’re enjoying this moisturizer, too! Hi, Thanks so much for posting your skincare regime. I ordered all the necessary ingredients and made all three steps last night! (Cleanser, toner, moisturizer) I looove how it makes my face smell! Anyway, I don’t know if it’s because I do all three steps in a row, maybe I’m not wiping off the cleanser very well, but it takes forever for the moisturizer to soak in. Like well over an hour at least. Anyway, I was just wondering how you proceed with makeup application after using the 3 steps? Or maybe you can provide me with some tips of how I might be doing it wrong that it’s not absorbing? Thanks so much and I love your blog!! 1/ Your skin may need a different oil. Which oil are you using for the moisturizer? Some oils take longer than others to absorb into the skin, too. 2/ You may want increase the aloe a bit, so there’s more aloe and less oil in the moisturizer. For me personally, I wear makeup over the moisturizer most days (if I use the moisturizer in the morning), but at night, I don’t put anything over the moisturizer. I use a wet (warm) washcloth to thoroughly rinse my cleanser a few times, too, before using my toner and then moisturizer. Hi Kristin! Aloe Vera is the ingredient loaded with skin and hair benefits. But as moisturizer I doubt. My skin is too dry and I use olive oil as moisturizer. BTW nice post! Hey Mellisa, I definitely encourage everyone to do what feels best for their skin. For me, adding a bit of aloe to my oil moisturizer is wonderful for my skin. I’m glad you’ve found something that works well for you :). Hi. I am from India. I love your blog. I am extremely new to the world of DIY. I have an extremely extremely sensitive skin, I can’t use a single chemical on my face. Not even for face wash. I never apply makeup. It’s is full of breakouts year round. And India is a hot country. Right now we have temperature from around 35-38 degree Celsius. Hence this facial moisturiser might me useful to me. How long can I store this moisturiser? Hey Aakruti, If you’re using a bottled aloe vera gel this may be stored for several months, about 3 months in my opinion. If you’re using fresh aloe it’s best to store this in the fridge for just a few days, about a week. Let me know how it goes! I just discovered your blog and can’t wait to give a few things a try. What ratio of aloe and oil is used in this recipe. Hey Jayme, I used a 2(oil):1(aloe vera) ratio. Hi Kristin! I’m a big follower of your blog and your recipes have helped me a lot in finally letting go of those expensive, store-bought, chemically-ridden facial products. I’ve been using the honey face wash, ACV toner, ultra-moisturizing lotion (w/o coconut oil) and facial serum for months now. I do plan to try out your deodorant recipe in the future. While I have been using the ultra-moisturizing lotion the past couple months, I do feel that it is a bit greasy for the summer months. Thus, the reason for wanting to try this aloe facial moisturizer. Does this feel a bit more like the facial serum? I love the facial serum because my skin loves it and it hardly has any greasy after feel (even in the summer months!). If I do add some vitamin E and essential oils (lavender, tea tree, carrot seed), how much should I add to the mix? I’m guessing my skin would be similar to yours (because I followed the facial serum quantities down to a t — using teaspoons), so what oil to aloe ratio should I follow? Hey Me-An, I’m so glad you’re enjoying the recipes. Yes, this recipe feels like the serum, very light, versus the heavier moisturizing lotion/butter. I really prefer this moisturizer for the summer. I’d also recommend sticking with almond oil since it’s very light. I like using equal parts aloe and almond oil. If this feels like too much for you, I’d leave room the jar so you can add more aloe. Thank you! And about how much vitamin E and how many drops of essential oil should I add? I do have all 3 kinds (lavender, tea tree & carrot seed) since I used them in previous recipes. Dude, I posted this same recipe with a similar narrative almost a year ago. Your pictures, graphics and story are better though. 🙂 It could easily be a coincidence. The internet is a wild world. Small world, Tiana. I’ve never seen your site before. Thanks for sharing. Does this protect your face from the sun? Anything I can add for sun protection? Hey Lisa, This won’t provide any sun protection. Unfortunately, I don’t have a recommendation for adding sun protection. The best option would be to use a foundation (if you’re wearing makeup) that provides this protection. 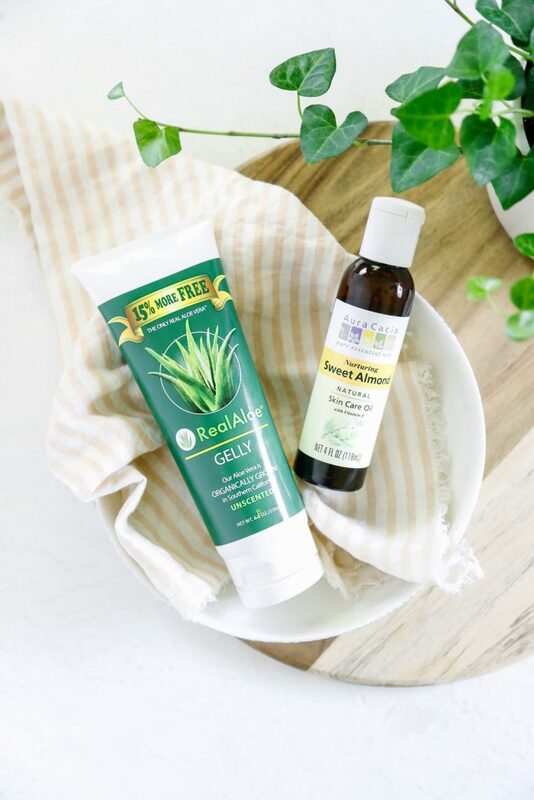 Hi, can I use aloe soothing gel instead of aloe gel? Thanks! Hey Brenda, As long as aloe is included in the ingredient list, then it should work. I’m so in love with this DIY, thank you so much for sharing. I use it on my hands and face, it’s completely replaced my store bought moisturizing products. I use the aloe vera with my Leanne Grace Miracle Beauty Oil & Serum (previously Blissful Body) with the most amazing results!! No heavy or oily feeling after use. Hey Sabrina, That’s so great to hear. I’m so glad you’re enjoying this moisturizer. Hi Kristin. I wanna say to you Thank You!!! (In advance) for your obvious dedication to making All Natural products for skin and more. With Special Thanks for your time you spend sharing all your “Finds” with us! I’m 58, an fairly new in trying to navigate websites, blogs etc ( still don’t know what a Blog is. Lol). I stumbled across your Pinterest posts an have been reading them enthusiastically for about 2 hrs now. You’ve brought me back in time, remembering the 70’s, HA, and how much I loved making homemade facials, & hair masks. All that was popular then ( yes I was a “Hippie”). I particularly remember using honey and vitamin E That I’d extract from the E capsules. I’m currently in a situation where money is tight, and can’t buy the products I use to but honestly, money or not, I’d prefer to use the low cost, natural products you share. I’m excited an looking foreword to the first of the month, when I’ll have the means to buy everything needed to follow your recipes!! Sorry I’m blabbing on and on it’s just I’m truly excited and grateful that I stumbled across to you. How do I continue to follow you seeing ALL your recipes and answers to questions I might have? I’ve been blessed with really nice skin, no wrinkles but some sagging starting around my jawline and what seems to be, permanent circle indentations under my eyes. Any suggestions?? Also, unfortunately my 19 yr. old daughter wasn’t born with beautiful skin (facial). It really makes me sad because she’s such a beautiful girl inside and out and her skin really upsets her. I’ve already taken up too much of your time to list the things we and her alone have tried! Her acne isn’t the typical T-zone problem, it’s on the sides of her face and oily some areas but very dry at the same time where it gets flaky where the acne is. I’d love nothing more than to ” find a cure” but obviously I don’t think there is. I’d love to hear some feedback on it if you have any knowledge or findings in this area. Again, I Thank You for You. I’m so glad you’re enjoying the site :). The best way to continue following the blog is to sign up for our weekly newsletter (it’s free): https://livesimply.me/subscribe/. I send out a weekly newsletter featuring tips, encouragement, and weekly blogposts. For the circle indentations, I wonder if something like an eye serum would help? I use a caffeine-infused one from 100% Pure and absolutely love it. For your daughter, there may be a lot of hormonal components, since she’s 19. Adding good probiotic foods (like plain yogurt, kefir, etc.) and fermented food (like real pickles, sauerkraut, etc.) really helped me. Also, cleaning up my skincare routine helped quite a bit–using very basic ingredients to clean, tone, and moisturize my face (aloe, honey, apple cider vinegar, shea butter, and a nourishing oil) and clean makeup (I love 100% Pure). I’d also recommend a book called, Skin Cleanse. It would be a great read for her. Just ordered the coffee infused eye cream you recommend, so excited to try it. Tomorrow I’m going to buy the ingredients for your face regime. I’ll let you know how it goes!! Awesome, Margaret! I love the eye cream–it’s my go-to product on most mornings. Hi, I am curious, will oil cause tanning? I don’t want any tanning on my face. Hey Alia, I haven’t experienced any unnatural, increased tanning. The oil should sink into the skin after a few minutes–only a small amount is needed. I also wear makeup on my face, most days when I’m out, so that may also help. If you’re going to be in the sun for an extended period of time, using sunscreen over the moisturizer is a good idea (whether it’s this moisturizer or another one). Shea butter does have a bit of an spf (although very low..around 6), so this moisturizer may be a good fit: https://livesimply.me/2017/03/24/shea-butter-cream-facial-moisturizer/. So… first of all, thank you for taking the time to write up such a detailed blog. There’s a level of “I truly care” in this that I appreciate. I have spent 9 years out at sea (USCG) and the sunshine and salty air hasn’t fared well for my face. I am 33, turning 34 the 31st of May. And often I hear: “oh, I thought you were older” or “much older” and my wife will sometimes repeat that same statement. I normally don’t care much… but I just wondered if you thought this might help restore elasticity or bring back some youthfulness to my face. Or since the damage is done… is there another remedy you’ve seen tried and true… proven. Hey JoshuaB, Thank you for the compliment–that’s very true :). For the skin, I’ve had good success with adding collagen peptides (Vital Proteins brand) to my daily diet. Also, using honey to wash my face and even as a mask (mix together aloe and honey, or even a bit of olive oil and honey) has helped too. Consuming lots of healthy fats and drinking water (hot lemon water in the morning) also helps me. I LOVE this moisturizer! Its by far the best moisturizer I’ve used. I’ve never been happy with the results of the store bought products I tried. I adjust the ratios for my need and I keep it moving! This one is awesome! Thank you for sharing. I’m so glad you like it, Jacque! I fixed the star rating ;). Thank you! I’ve been using this for 2 weeks, and I absolutely love it! Thank you! I mixed 1 Tablespoon Aloe Vera Gel – the one you recommended – with half a Tablespoon of grapeseed oil, and half a Tablespoon of jojoba. I added 18 drops of lavender essential oil and it’s been total bedtime BLISS! I’m gonna sub a bit of rose geranium and some frankincense frereana to help my skin – acne scars and age! Thanks again! Wow, I’m so glad you’re enjoying it, Suzie! Lavender is such a wonderful essential oil, especially when added to evening facial products. Great idea about the geranium and frankincense. I’ve made this moisturizer twice and like it a lot. Shortly after making it though, my mixture takes on more of a lotion texture and color (silky white). Is it suppose to stay the light/liquidy? I don’t think it’s going bad, as it’s only a few days after being made (not using natural aloe either). Just wanted your thoughts on why the change in color/texture. Hey Noel, I’ve found that’s pretty common with some aloe brands and mixing oil. If you’re shaking it well, it almost seems to emulsify–my thought is an ingredient used with the aloe helps this process happen. As long as it doesn’t smell rancid or have any growth, I don’t think it’s going bad. How about for acne prone skin? What oil should I use along with aloe? Hey Meredith, I like almond oil for my acne-prone skin. It’s an oil that works well for many different skin types and it’s very light. Hi! Just made it for the first time and I love it 🙂 I put it in a glass blue-colored squirt bottle. About how long should it last in there? Hey Savanah, Awesome! If you used an aloe with a preservative (from a bottle), then about a month. Also! when buying aloe vera gel, does it need to only contain aloe vera..? i cant find any. the best ive found so far is 98% aloe vera! Hey Markus, I wouldn’t mix shea butter with this mixture. You could mix oil and shea butter (a body butter: https://livesimply.me/2017/03/31/how-to-make-easy-body-butter/). Any bottled or tube aloe will contain other ingredients, mostly preservative ingredients to keep the aloe from spoiling.